April is National Pest Management Month which means it’s time to recognize the role the pest management industry plays in protecting people and property against the threats of pests. First celebrated by the National Pest Management Association, this month-long recognition has been going on for over 30 years now! It also happens to be the start of a season in which we begin to see unwanted spring and summer pests return to invade our cookouts and homes. So in honor of National Pest Management Month, the pest management professionals at Modern Pest Services would like to share some tips for homeowners to prevent infestations of ants and other pests as the weather heats up. These tips for the outside of your home will help avoid the threat of pests like rodents and carpenter ants from causing structural damage and leaving costly repairs and damages. Also, by following the pest prevention tips, you will be decreasing the chance of major health concerns from pests like mice and cockroaches who can spread diseases and leave family members and even pets sick. 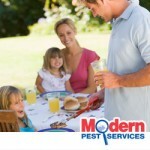 If, despite your best prevention efforts, you notice signs of insects and rodents infesting your home or property in Maine, New Hampshire and Massachusetts, contact Modern Pest Services today. Offering highly effective home pest control services, our experienced pest management professionals will inspect your home and customize a treatment plan that will help protect your home and family from the pests in our region. For more information, contact us at 1-888-997-3312.